If you’ve ever had a problem with your garage door not opening or closing, no doubt each instance caused you some level of anxiety. You may have had somewhere to go and couldn’t leave your garage because the door wouldn’t open. Worse than this is when your garage door is open and you can’t get it to close. Then what is one to do? You can’t just go about your business leaving the door wide open. If you have a garage attached to your home, this is most dangerous as anyone could walk into your home through the garage. It is important that you quickly determine exactly why your door will not close so that you are not being inconvenienced for too long. This is the device that enables you to operate the doors of your garage. The first and most logical thing to do, when your doors will not close, is to change your batteries. This means changing the batteries of your wall keypad, remote control and any other component within the garage that requires batteries. Chances are that they will all eventually need to be replaced. If this clears up the problem, save yourself the frustration of experiencing the problem again in the near future by replacing all of the batteries at one time. The sensors are generally located close to the floor of your garage door, near the front. If there is anything blocking them, they will not be able to communicate with the garage door opener. This means that the doors will not move. The sensors may also have dirt or even mud on one or both of them. In this case, the sensors will not function. You can usually identify the problem by inspecting both lenses and making sure they are clean and that nothing is obstructing them. The aforementioned troubleshooting techniques are just two of the most common instances we come across. 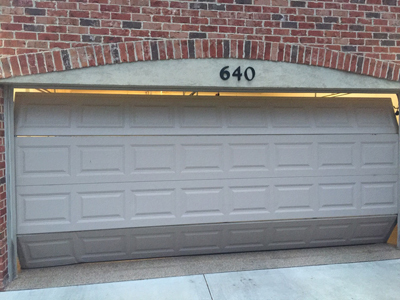 However, you should know that there are a host of reasons your garage door may not close. There could be a problem with your automatic opener or even some of the safety features. The problem can usually be easily identified if you know what to look for. So remember to check the batteries and the sensors and you just may be able to get that door closed and maintain your sanity.